1. 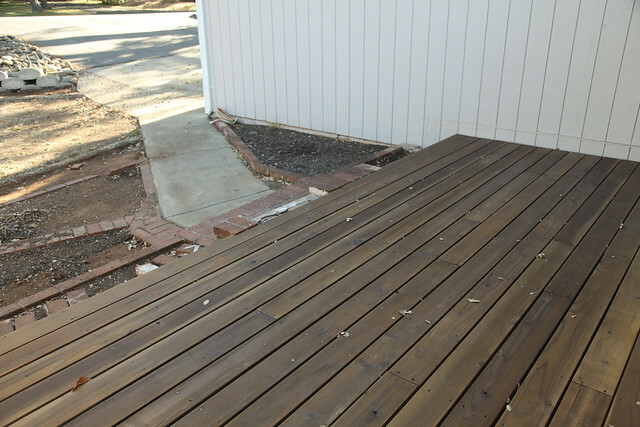 Staining and sealing the deck. 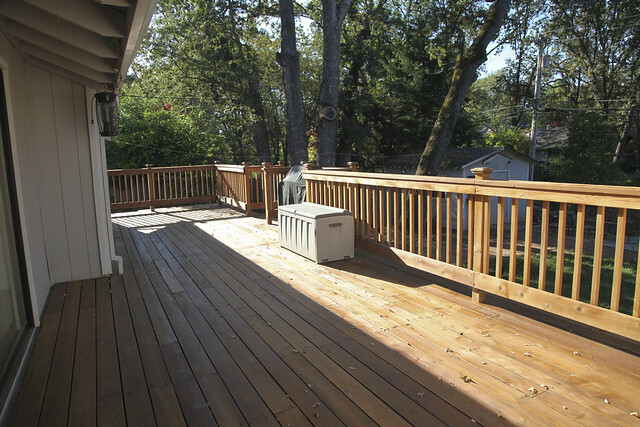 The previous homeowners never did this when they originally built the deck. We recently had Joshua’s adopted father over to assess our yards since he’s a professional landscaper. Because we want to keep things simple and fairly low maintenance, most of the work we have to do involves cleanup and removal. 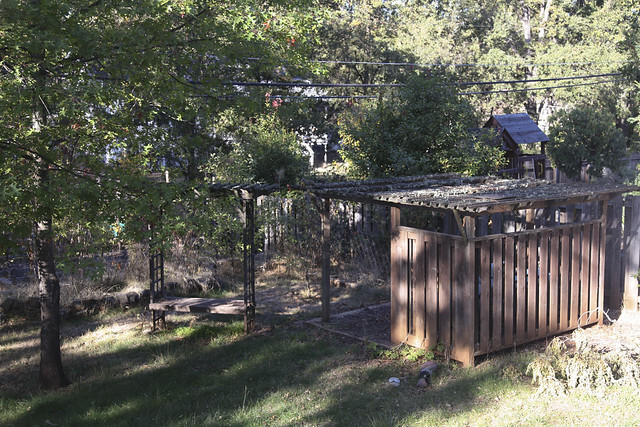 We started cleanup in the backyard mainly due to the fact we had a tree branch fall down and damage the shed in August. My brother in-law came over to help us turn the branch into firewood and thus motivating us to continue cleanup. Joshua removed the fig tree plus a whole lot of other vines, random branches and whatnot. After a few dump runs we paused on the backyard and turned our attention to the front yard. I’ve avoided showing pictures of the front yard until now because it has basically looked like this since we moved in. 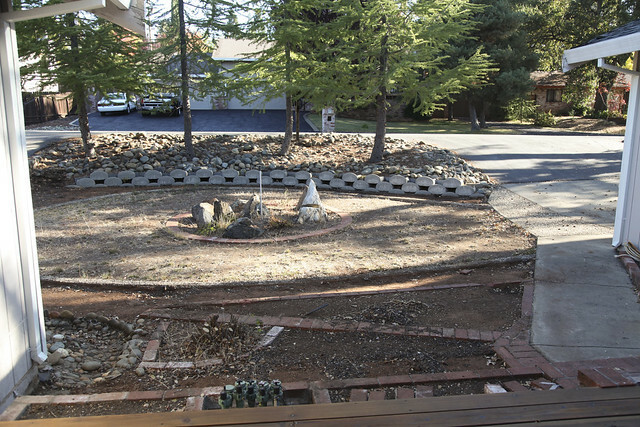 The only difference in these pictures is Joshua pruned the trees and removed all the pebble rock. Originally the front yard had beautiful green grass. Unfortunately we never got to see this because the previous homeowners killed all the grass when they were spraying weed killer. When we first saw the house the homeowners were actually outside attempting to water the front yard. 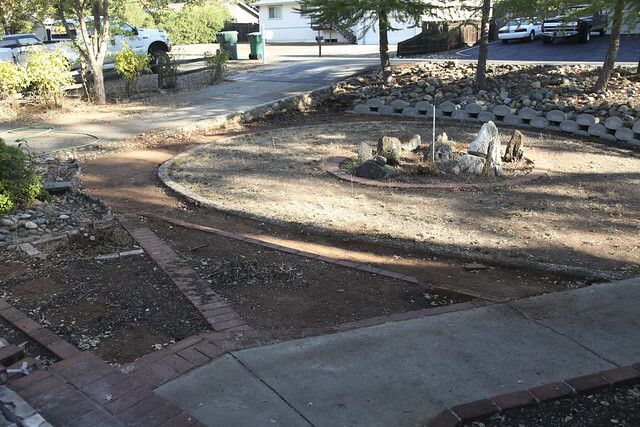 The plan is to tear out all the weird brick and that weird horseshoe-shaped cement thingie and have nothing but nice green grass again. We’re hoping to get this done by the end of this month. We’ll see what happens! Last week we finally got both the front and back decks stained and sealed! It’s a clear stain, but it brings out the richness in the wood. It looks so nice now! I feel so much better now that this has been taken care of. Next step is finishing the front yard!